A low-ranking ninja Digimon that always operates in a group. 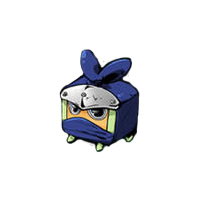 Even though they are said to be in a group, they each operate within a fixed range from the others while hidden under vegetation or in the shade of a rock, and it can be said that while it has the appearance of an underling, it seems to be a ninja after all. Its emotions tend to project on its face, so while it always pretends to be calm, its emotions show up on its face (monitor) in the shape of emoticons. Furthermore, because it even projects its dreams from its face when it is asleep, everyone can see them, and it gets very embarrassed. Its Special Moves are leaping upon the opponent in a group (Rappa), firing a water pistol from its mouth (Suppa), and instantly running away at high speed (Toppa). 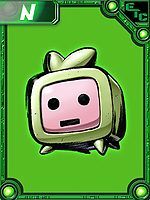 A low-ranking ninja Digimon that always operates in a group. Its emotions tend to project on its face, so while it always pretends to be calm, its emotions show up on its face (monitor) in the shape of emoticons. 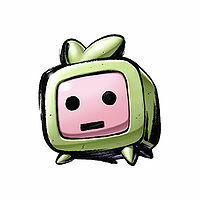 Its Special Moves are leaping upon the opponent in a group (Rappa), firing a water pistol from its mouth (Suppa), and instantaneously running away at high speed (Toppa). 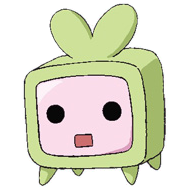 n., Short for 「モニタ」 monitor. Gangs up on the opponent with other Monimon. Sprays a water pistol from its mouth. 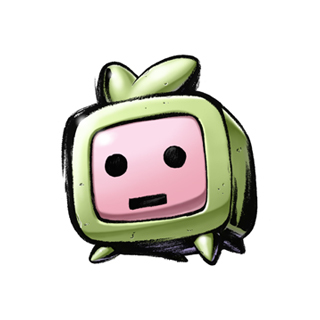 Instantly runs away at high speed or teleports itself and allies out of harm's way. 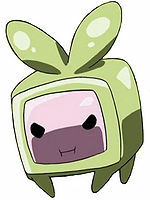 Amano Nene can occasionally be seen carrying a Monimon around with her. Monimon's animal form in Digimon Xros Wars (Manga). This page was last modified on 19 February 2019, at 02:25.